A Bloomberg article “Unloved European Stocks Poised to Become ‘Pain Trade’ of 2017” prompted me to review some of our European equity strategy charts. Indeed, we last looked at European equities in the 18th November edition of the Weekly Macro Themes and concluded”After some adjustment following the recent peak, European equities are starting to look better, with neutral valuations, improving earnings, and a turn in fund outflows”. Since then European equities are up about 10%. So where are we at now? Following on from the Bloomberg article, the above graph shows forward PE ratios for theS&P500and the MSCI EMU Index (I used that index because it has better data/longer history). 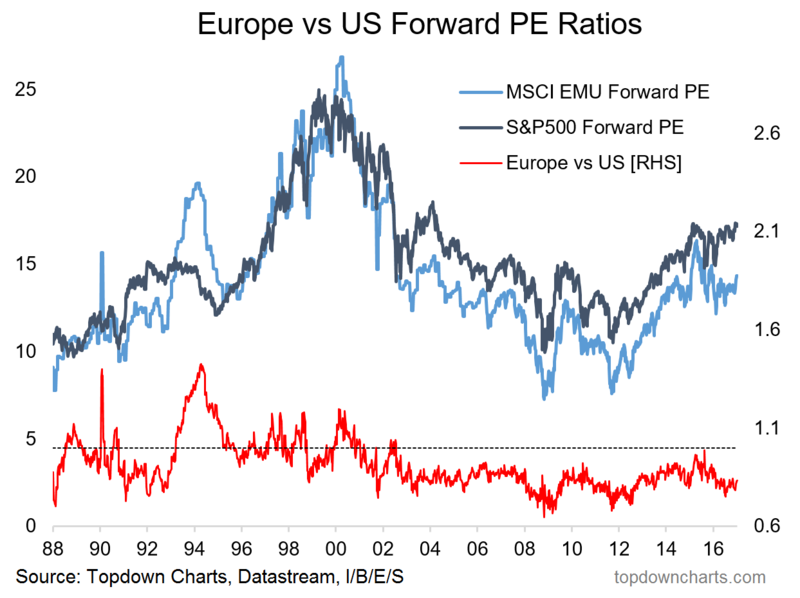 And it is true there is a decent valuation gap between US and European equities. If you look at the red line (relative valuation) you can see that the last time European equities were this cheap relative to US was around 2012… i.e. during the European sovereign debt crisis! However it should be noted that absolute valuations are much higher since then. But it does go to show the potential opportunity there in the form of catch up. To be fair, such gaps can close through either “catch up” (Europe rising to meet US) or “catch down” (US falling to meet Europe) – and those can be two very different market environments. 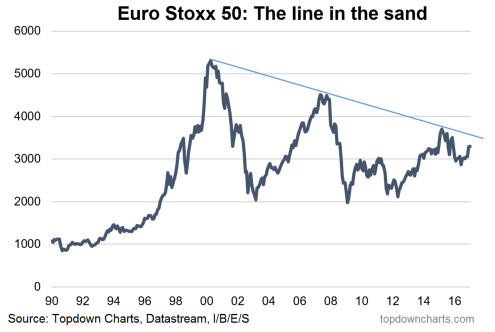 Finally, it’s worth looking at thechartof the main European stock benchmark, the Euro Stoxx 50. There is a curious downward sloping trend line that has so far proved impenetrable. That trendline is coming in to play once again. Will this time be different?